Would You Want Alexa or Google Assistant on Your Xbox One? Above: Not-at-all-real depiction of what Google Assistant might look like on an Xbox One. Microsoft’s Cortana hasn’t been a big hit on the Xbox One. Now the company might be looking at letting Alexa or Google Assistant join the party. 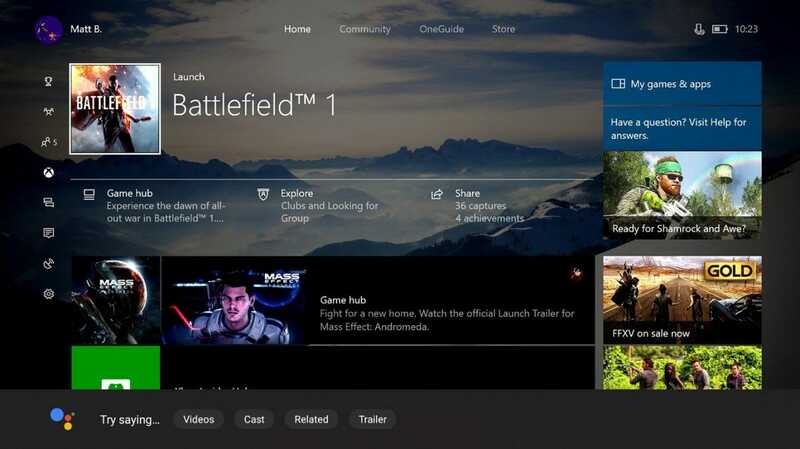 According to a leaked screenshot sent to Windows Central (which you can see at the source link below), a future update to the Xbox One platform will give users the option to enable digital assistants including Cortana (obviously), Alexa, and Google Assistant. This new feature hasn’t been confirmed by Microsoft, but it wouldn’t be that surprising. Some Windows laptops are already available with Alexa built in. It’s not that far of a stretch to imagine Microsoft would let Google or Amazon take a shot at an assistant on its console. Of course, it’s still a little unclear whether a game console is the right place for a digital assistant. With the Kinect discontinued, there’s not a decent way for a voice assistant to always listen for commands the way the Amazon Echo or Google Home do. You can use a headset to use voice commands, but that only really works sometimes. It’s also not clear how deep the integration will go. The leaked screenshot from Windows Central suggests you’ll have to enable the Xbox skill in the Alexa or Google Assistant apps, so instead of having a voice assistant living on your console, it might instead mean that you can control your Xbox from an existing voice assistant in your home. That might just do. Where do you land, though? Are you eager to control your Xbox with voice commands, or would you rather Microsoft stop pushing this feature altogether? And if you do want a voice assistant with your Xbox, which one do you prefer? Smart locks are a great way to add some convenience when coming and going from your house, and if you want one that works with your Google Home, there are some great options to consider.